View the impressive remnants of one of Tennessee’s largest historic iron-making operations. Buckfork Road Linden vicinity From Linden From downtown Linden, drive west on US Hwy 412 for 6.6 miles and turn left onto Buckfork Road; there is a Tennessee Historical Marker about the furnace at the intersection. 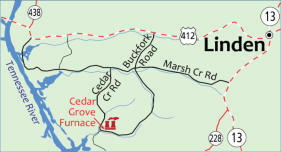 Drive south on Buckfork Road, crossing straight across Marsh Creek Road in 2.3 miles, and continue another 2.9 miles. The furnace will be on the right. Open daily, dawn to dusk. This quiet spot was once home to Perry County’s largest industrial operation, the Cedar Grove Iron Works. Originally constructed as a single stack furnace in 1832, it was rebuilt the following year as a double stack furnace, allowing one stack to be “in blast” while the other was being reloaded. This may have been Tennessee’s first “hot blast” furnace in which heated air from the burning charcoal was forced back into the furnace. This reduced the amount of charcoal needed and the accompanying labor. By 1850, the furnace was producing 1,800 tons of iron annually. The ore came from open pits on Marsh Creek to the north. More than 120 workers, many of them African- American slaves, mined the ore, cut trees and made charcoal, or tended the furnace. The industry was disrupted in 1862 when Union Navy gunboats shelled the furnace from the Tennessee River. Operations ceased the following year. The Cedar Grove Furnace is listed in the National Register of Historic Places. Picnic tables, a shelter and a playground are available in the adjacent park. 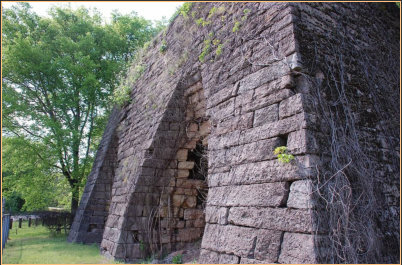 The Cedar Grove Furnace is a designated site on the Tennessee Civil War Trails system. This quiet spot was once home to Perry County’s largest industrial operation, the Cedar Grove Iron Works. Originally constructed as a single stack furnace in 1832, it was rebuilt the following year as a double stack furnace, allowing one stack to be “in blast” while the other was being reloaded. This may have been Tennessee’s first “hot blast” furnace in which heated air from the burning charcoal was forced back into the furnace. This reduced the amount of charcoal needed and the accompanying labor. By 1850, the furnace was producing 1,800 tons of iron annually. The ore came from open pits on Marsh Creek to the north. More than 120 workers, many of them African- American slaves, mined the ore, cut trees and made charcoal, or tended the furnace. The industry was disrupted in 1862 when Union Navy gunboats shelled the furnace from the Tennessee River. Operations ceased the following year. The Cedar Grove Furnace is listed in the National Register of Historic Places.